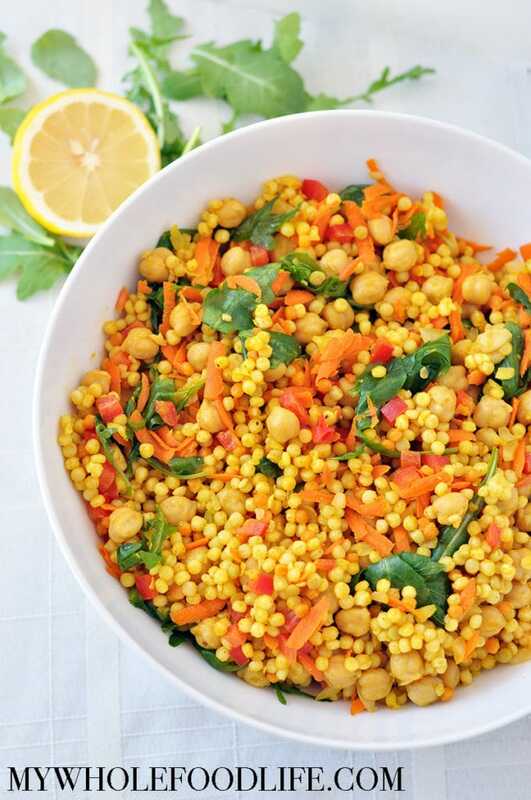 We eat at Whole Foods often, and this new recipe is a copycat version of the Curry Chickpea Cous Cous from the Whole Foods salad bar. I have several other copycat versions from the whole food salad bar. Two of my other favorites are the carrot ginger detox salad and the kale apple salad. I used Israeli cous cous to keep the recipe true to the whole foods version. I know cous cous is not gluten free, but I really do think buckwheat or quinoa could be used in place of the cous cous if you wanted to keep the recipe gluten free. However, keep in mind that buckwheat will take longer to cook than the cous cous will. We ate this cold like a salad, but you can most definitely warm it up if you prefer. It’s simple to make too. Whip this meal up fast. Delicious hot or cold. In a small saucepan , bring water and a pinch of salt to a boil. Once boiling, add the cous cous, cover and turn down to simmer. Cook until all the water has been absorbed. Usually about 10 minutes. Once cooked, let it cool. Once cooled, add the cous cous to a large bowl with the rest of the ingredients. Mix until combined. Serve immediately or refrigerate for later. I highly suggest letting the mixture marinate in the fridge for 30 minutes for the flavors to develop more. So glad you enjoyed it Beverley!